For my son's 2nd birthday this year I made him a car mat. This was a simple project, just a little time consuming. I got some of my ideas from the fiskers craft website. I also got a few ideas from homemadebyjill. At Christmastime I found the most adorable wooden airplanes, cars, school bus, fire engine, ice cream truck, police car, and even a tow truck in the dollar bin isle at Target. You may remember this little boy mobile that I made using wooden airplanes that I found on my same trip to Target. I really hit the jack-pot with these! I used these little cars as inspiration for the car mat. I made sure to have a fire station for the fire truck, an ice cream shop for the ice cream truck, a school house for the school bus etc. 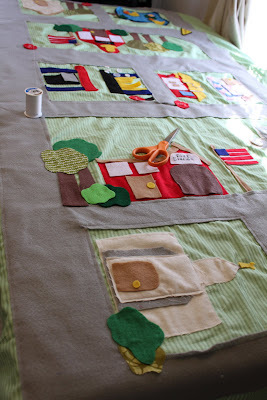 I then sewed the newly cut roads onto green fabric that I thought resembled grass. Cutting the little buildings, pound, animals plants, etc. was the fun part. I didn't use any patterns... sorry. I just used my elementary education degree background to help out with this... i guess. 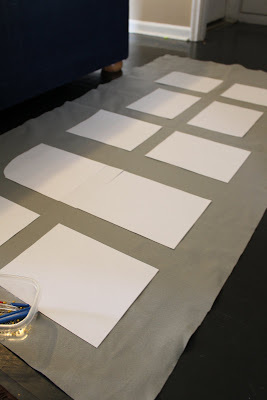 I can't draw, but for some weird reason I can cut shapes out of fabric.. or at least cut better than I can draw. I then pinned and sewed the large pieces onto their proper spots. For the smaller things, I used a hot glue gun. I know.. that isn't the most secure way of going about things, but the truth is I can always get my hot glue gun out again if needs be. Finally I sewed on a large back piece of fabric. I went for colorful boy stripes. I kind of quilted it on by sewing in the middle of each road with yellow thread. Then I bound the sides to complete it. We also gave my little boy a little wooden train track for his birthday that he loves to put on top of the car mat. This makes playing with cars and trains at the same time just that much more fun! So cute! I need to make this! I LOVE this!! I know my baby boy on the way won't be able to play with something like that for a while, but WOW. So cute! Lucky, lucky him! Hmmm....I think I my need to make something similar for my girls though! this is adorable. thanks for the ideas!